One of the greatest Dublin players of the modern GAA era. A man who transcended the racial divide to carve out a stellar career. Jason Sherlock grew up in Finglas, North Dublin. As the son of an Irish mother and Asian father, he experienced racism throughout his childhood. On the playing fields and basketball courts, he found acceptance, along with a new-found discipline to fend off the daily taunts. Sherlock represented Ireland in under-21s soccer, captained its basketball team and spent his summers winning hurling trophies in Cork. But in 1995, his life changed overnight as he was plucked from the fringes to become the best-known star in the GAA. He won an All-Ireland SFC title with Dublin, whose supporters gave him his own song. ‘Jayo Mania’ came out of nowhere and spread through the country like wildfire. Many opportunities arose from his new-found celebrity status. He became a TV presenter and started to mix with the great and the good, opening shops with Sylvester Stallone and Richard Branson, and gladly surfing the wave of celebrity. His soccer and GAA performances declined, and he began to feel like he was seen as a novelty or marketable product, rather than a sportsman. Over the next 15 years, Dublin failed to win another All-Ireland and Sherlock became utterly obsessed with trying to get back on top. In 2009 he was dropped from the Dublin panel, his self-worth plummeted and he started to label his career as ‘fourteen years of failure’. Not content to wallow for long, he began the fight to get his place back on the team. 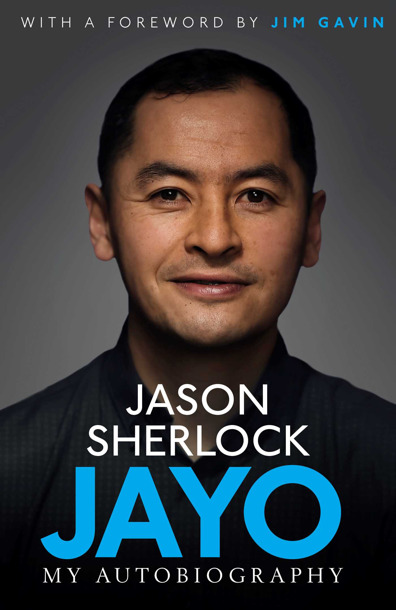 Sherlock’s story is one of a battle for acceptance, a fight against racism, and a climb to the highest levels of three sports, with a stop-off along ‘Celebrity Way’. It is the journey of a boy who was cast headfirst into the full glare of the media and who became an Irish legend. But more than anything else, this is a story of one man’s resilience.